£100 Deposit on booking (non returnable)balance 60 days before check in. SEA VIEW In premier location. 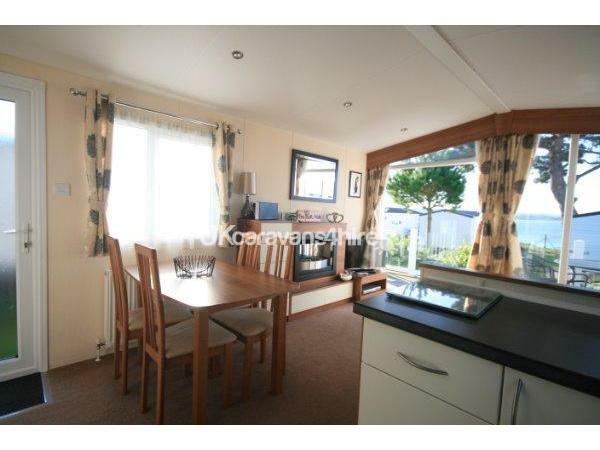 Pet friendly 2 bedroom 6 berth static caravan, double glazed & centrally heated. 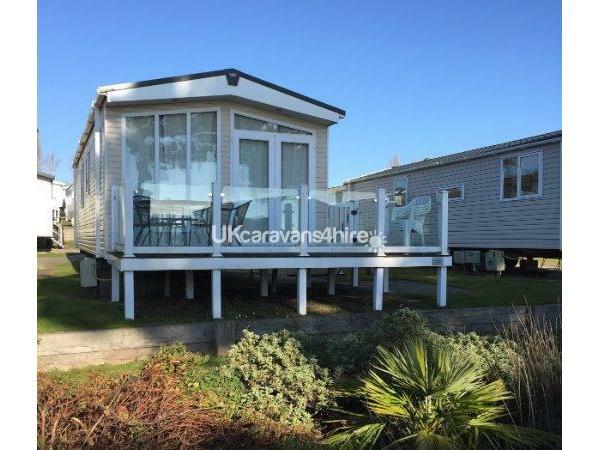 We have a stunning, spacious and modern 2 bedroom (sleeps 6) holiday home with a Balcony/Sun deck, situated on a wide sunny plot in the most desirable Bay Hollow which has a splendid sea view over the bay at the award winning "Rockley Park" in Dorset. 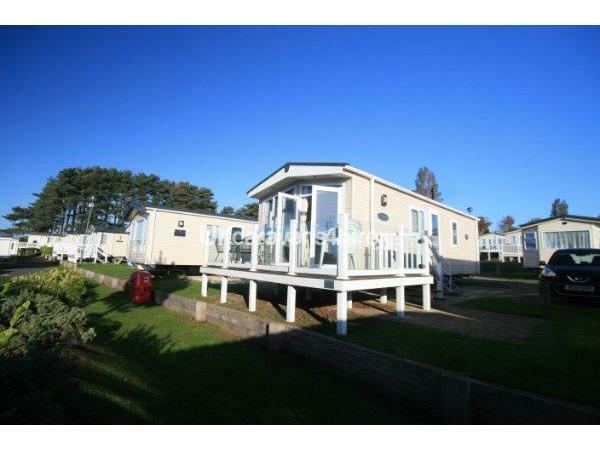 The holiday home is 'Platinum' graded and benefits from central heating and double glazing. 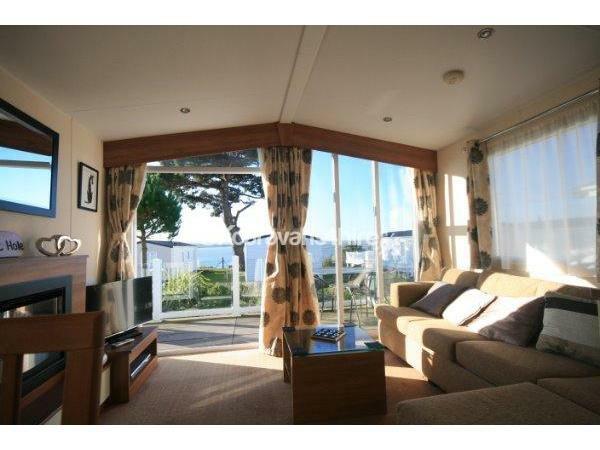 It is a short walk from the amenities and downhill 150yds to the lovely sandy beach, with cafe and water sports. Master bedroom: This room has a double bed with fitted mattress protector. 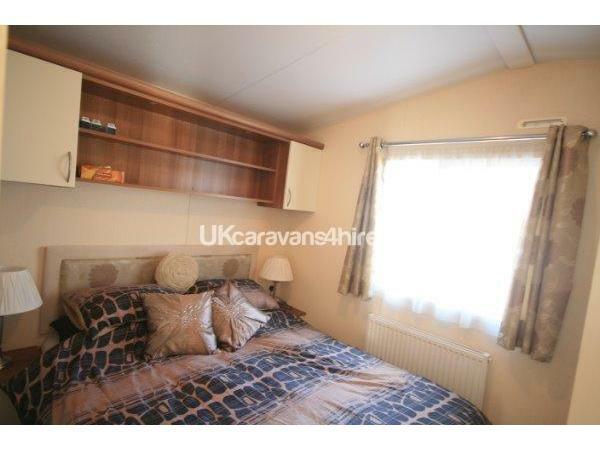 Fully fitted wardrobes with loads of cupboard and drawer space. A hairdryer is provided. 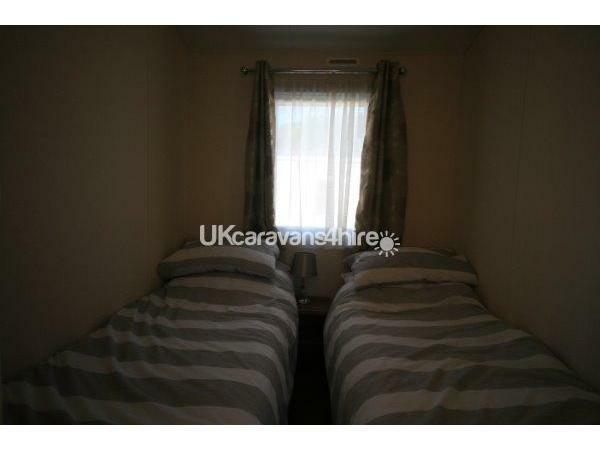 Second Bedroom: This room has twin beds with fitted mattress protectors, wardrobe and cupboard space. Shower room: This room has a walk in shower, toilet and vanity basin, above there is a light and shaver socket. 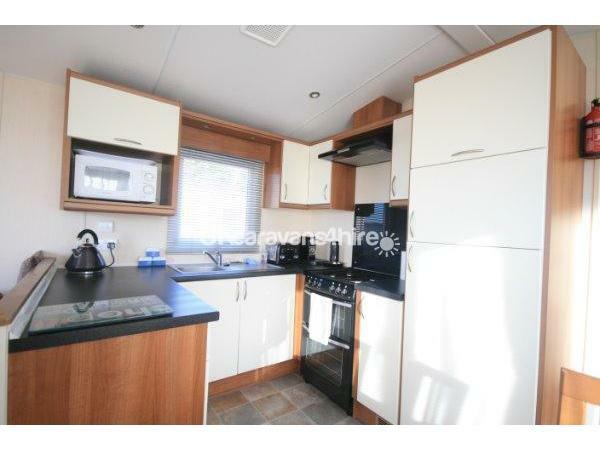 Kitchen: A spacious fully equipped kitchen with cooker, microwave, toaster, Nespresso coffee machine, large fridge/freezer, crockery, cutlery, glasses, kitchen utensils, plenty of cupboard space and dining table and chairs. There is an ironing board and iron and a hoover. Lounge area: The lounge has free standing furniture, comprising of a 4 seated sofa and flat pad seat, coffee table, an attractive electric fire, 40" flat screen TV, DVD player and CD player. Patio door leads out to a large Sun Deck and Balcony which is equipped with table and chairs. The garden area has a wooden bench table, grassed area and block paved car park space. Duvet and pillows are provided but please bring your own linen (Towels, Duvet covers, sheets, pillow cases, kitchen towels). Alternatively these can be hired if previously requested from Haven/Rockley Park. 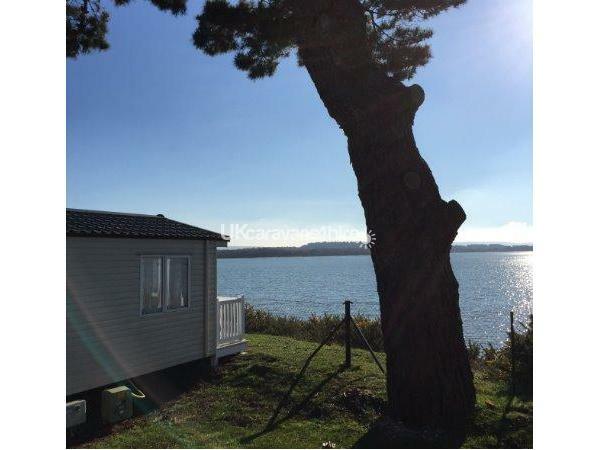 Fun works passes that allow access to all of Haven activities, bars restaurants and facilities are not included in our prices which are for holiday home hire only. These passes are obtainable from haven on arrival if required. (We have forms to fill out or we can email notification). Additional Info: Fun works passes that allow access to all of Haven activities, bars restaurants and facilities are not included in our prices which are for holiday home hire only. These passes are obtainable from haven on arrival if required. (We have forms to fill out or we can email notification).The park facilities include-Sandy beach with cafe. Many watersports for hire and lessons available!Bike hire is on site. Indoor pool with splashzone grotto, heated outdoor pool, crazy golf, tennis courts, climbing wall, trampolines, slot machines bars and restaurants.Several takeaway restaurants (Papa Johns Pizza delivers to your park home, as do local Chinese and Indian restaurants).A luxury Spa is on site for a little pampering!There is daytime entertainment for kids and evening entertainment which is first class with many good star acts. (this area has just received a £150,000 facelift).Locally there are too many attractions to list but with Blue flag beaches and attractions like the Tank museum, Monkey World, Farmer Palmers, Paultons Park (pepper pig world), Alice in wonderland park, Adventure wonderland, Marwell Zoo and much more.The Jurassic coastline is a wonder in its self just to walk along!